The newly built fortification facilities outside the town of Artemivsk were shelled by Russian-backed militants an hour after they were officially commissioned. Two Ukrainian soldiers were killed in the attack. Deputy head of the coordination center of the Staff of the anti-terrorist operation (ATO) Ilya Kiva announced this on the air of Espresso TV. 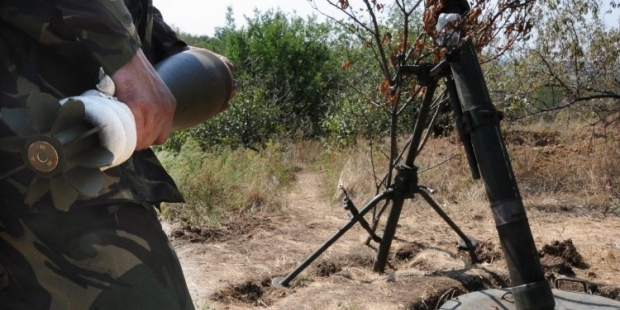 "[Russian-backed militants] launched an attack on the front positions of the 30th mechanized brigade [of the Armed Forces of Ukraine] from an 82mm-caliber mortar just an hour after the fortification facilities were opened. Then they engaged 120mm-caliber mortars. It lasted for about two hours. The final round was shelling from Grad [multiple rocket launchers]," he said. According to him, two soldiers from the 30th brigade were killed and nine were wounded with different levels of injury. "Another problem was that a dug-out shelter where soldiers were sheltering from the firing was destroyed. An operation to rescue them is complicated by continuous firing from mortars," Kiva said. "All this shows that we should accelerate the enhancement of the defense of the entire eastern front-line," he added. The first stage of the fortification facilities were opened near the town of Artemivsk in eastern Ukraine on Thursday. Prior to that, the National Security and Defense Council of Ukraine approved a number of measures to step up the country's defensive capacity and decided on the acceleration of the construction of the fortifications and defensive lines in Donbas.